Adobe Photoshop is the standard software used by artists that license art. It is used to create art collections, create product mock-ups, and for editing art to manufacturer specifications. If artists do not know how to use Photoshop, they are at a distinct disadvantage in trying to license their art. Of course artists could have someone on their staff manipulate their art for them or outsource the work. Or, they can learn how to use Photoshop themselves. Unfortunately not all artists are computer literate. Some are hesitant in spending the time or willing to tackle the challenge on learning the software. But artists that have actually taken that step and learned Photoshop are very glad that they did because it increased their productivity and given them many options in increasing their creativity. Below are some ways to learn how to use Photoshop. If you are daring enough to learn Photoshop on your own, you can checkout all its tools and methods and thus teach yourself how to manipulate and edit your art. I've done that myself but as a result I only learned the fundaments of Photoshop. Photoshop can do much more than the average person normally learns by trial-and-error. You can can increase your knowledge by watching Photoshop tutorial videos (also by reading step-by-step tutorials) and discover how to do amazing things. One way to learn how to use Photoshop is to watch video tutorials. Adobe.com has some good tutorials on their site, and so does youtube.com. Another site that has excellent tutorial videos for Photoshop as well as other software is lynda.com. For a $25 per month subcription price you have access to hundreds of their training videos. They also have some free videos! Another way to learn Photoshop is to take classes at an adult education center, a local community college, or art and design college. To be productive for your needs, make sure that you take a Photoshop class for artists instead of photographers. These classes are jammed packed with information and move fast so they can be overwhelming. Thus, taking classes may not be the best method to learn Photoshop for everyone. Some artists find that working one-to-one with someone that knows Photoshop works best for them. This could be a family member or friend or could be someone that you hire. A good source in finding a Photoshop coach is in the computer department at your local community college. Ask Photoshop teachers if they can recommend a student who you can hire. Comments are welcome. Please enter them in the below comment section. There are times when a manufacturer wants an artist to change the colors of certain elements in her/his art. For instance, a fabric manufacturer may want 1. additional colorways of the same pattern, or 2. a Christmas painting is in chartreuse green and bright red but the manufacturer wants the traditional dark green and dark red, or 3. a manufacturer immediately needs a certain theme and colors for a client and the artist has the right theme but does not have the right colors and no time to create a new painting, or 4. an artist may want to change some of the colors in an existing painting to make it fresh and new. 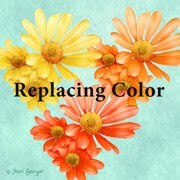 There are many ways to change colors in Photoshop and each method has its own merits. Some of the methods listed below are similar but check all of them out to discover what method(s) works best for you. "Change Car Color in Photoshop"
view video "Photoshop Guide - Changing color of a car!" view video "Photoshop: Change Hair Color in Photoshop"
view video "Changing Hair/Eye Color in Photoshop!" view video "How to Change Lip Color in Photoshop With Curves Lesson 19"
I welcome any comments or suggestions of this article. Please write them in the comment section below. There are two advantages in getting multi SKU licensing deals - good money and visibility of the art. SKU (pronounced skew) means a stock-keeping unit and is used by retailers to keep track of individual items for inventory. In the fabric industry EACH fabric in a collection is a SKU. For example, a fabric collection could contain six patterns but have 12 fabrics because of multiple colorways. And the artist receives royalties on each of the 12 fabrics. For bathroom products, a bathmat, a shower curtain, a toothbrush holder, a soap dish, a soap dispenser, etc. are each separate SKUs. So if an artist licenses one collection* of designs to a manufacturer she/he will be paid royalties for each SKU which can add up to a substantial amount of money. Besides getting significant money in multi SKU deals, an artist gains visibility of her/his art. Collections of products are placed together sometimes in their own racks which makes an impact with the consumer. That means more visibility of the art and thus more sales. The more sales the more the manufacturer reps notice and pass on that information to other manufacturers which could generate additional licensing deals. This may create a snowball effect and the reason why recently there have been a proliferation of art on products by artists Jim Shore and Susan Winget. So how do you get multi SKU licensing deals? 1. have art that consumers want. Use an unique art style and create popular themes. 3. approach manufacturers that create multiple product SKUs such as fabric manufacturers, greeting card manufactures, or companies such as Highland Graphics, Inc. or Evergreen Enterprises, Inc. that produce a multiple of different type of products. 4. convince the manufacturer that your art is perfect for their products. It helps if the art is formatted in several different shapes (see the art at the beginning of the article) and as mock-ups of the products that the manufacturer produce so that they can visualize the art on their products. It also helps, but not necessarily a must, if the art has already been successful on products in other industries and translates well onto the manufacturer products that you are "pitching" to. * A collection can be one central design or theme formated different ways (fabric, bath, tabletop, etc.) or it can be a series of cohesive designs such as for a greeting card line. Read "What are Art Collections and Why Create Them?" and read articles about creating collections in the "Art Collections/ Mockups" section of this blog. Make sure you read this article comments to see what an art director said about making interesting cohesive collections for multi SKUs! If you have a comment about this article, please click on the below comment section to enter it. The quilt and craft fabric industries are thriving and fabric manufacturers* are looking for artists that create designs suitable for those industries. Knowing the type of designs and themes needed gives an artist the leading edge in licensing her/his designs to these industries. And the only way to get that information is to study the industries by visiting quilt and craft stores in person or online, looking at the manufacturers websites to see the design styles and themes that each of them have, and attending quilt and craft shows. Also it does not hurt to take one or two classes to learn more. If you think that is a lot of work, then designing for these industries may not be right for you. The more you know the better you can create designs that sell. For instance, traditional quilters look for collections of fabrics that have small size motifs in one fabric, medium size motifs in another fabric, and large size motifs in another fabric but usually do not want a panel(s) of central imagery. Color is also important as well a shades of color (light to dark). The reason is to make the quilt look more interesting when piecing traditional quilt blocks. Theme quilts such as exotic florals and animals may not need different size motifs fabrics to make the quilt look interesting but will still need to have patterns in the collection that compliment each other. 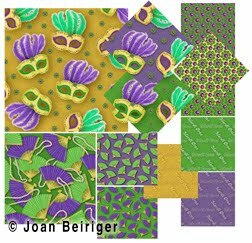 And fabric collections for craft projects may contain panels of art, a few associated motif patterns, or even outlines of product shapes (with patterns and art) on the fabric. * Not all fabric manufacturers actually produce the fabric they sell but are fabric converters. Fabric converters are companies that choose fabric patterns and have the fabrics printed at outside printing plants. What an artist should know before designing and submitting to quilt fabric manufacturers. 1. Artists should know how to use Adobe Photoshop to either remove backgrounds from scanned art or use it to create icons/motifs for patterns. The software is also used to create the patterns by moving the icons/motifs into pleasing pattern designs. Note: Some artists prefer to create icons and patterns in Adobe Illustrator because they can be enlarge no matter their size without losing the resolution of the design. Also it is easier to change the colors in Illustrator than in Photoshop which is often needed when manufacturers ask for additional colorways of the patterns. 2. Artists should know how to do repeat patterns (simple, toss, half-drop) or at least know what repeat patterns look like so that they can create them. Using a combination of simple, toss, and half-drop repeats in a fabric collection gives it interest. Also an artist may be required to do repeats if the collection is licensed. Tara Reed has written two e-books on creating repeat patterns if you do not know how to create them. Note: Some artists that license their designs to fabric manufacturers recommend that artists new to the industry do not spend too much time in creating patterns that repeat precisely because each manufacturer uses different repeat sizes (every 12 inch, 16 inch, 18 inch etc) and may even have their in house illustrators create the repeats from the artist's designs. To save time an artist can create patterns that gives an illusion of repeats with balanced icons that are not exactly measured. The exact repeat can be done by the artist or the manufacturer's in house illustrator once the designs have been licensed. 3. Artists should create and submit collections of patterns that complement each other. See examples of fabric collections by looking at fabric manufacturer websites listed at the end of this article. 4. Each manufacturer usually have exclusive licenses with featured designers that supply designs for their product lines. Many of these designers are well known in the quilting world because they have published books and/or taught quilting. However, not all must be well known in order to be a featured designer so it is possible for an artist to become one if she/he has a unique art style and themes. Some manufacturers also license designs from artists that they do not have exclusive arrangement. They use that art for clients that want unique designs for their company such as retail chain stores and scrub style clothing. Note: The only way to find out each manufacturer's requirements and submission guidelines is to call and ask. 5. Artists need to learn about the manufacturers they are submitting their designs. Check out the websites and make sure the designs fit the manufacturers line but are not too close to their existing designer collections. If the designs are too similar, than the likelyhood of the designs being licensed is slim. 1. are in repeat patterns. 2. have themes that are popular with consumers. 3. are in collections of patterns that go together including generic icons, theme icons, and backgrounds. 4. are in collections of five or more patterns that can be adapted to additional colorways so that 12 or more fabrics for the collection can be produced. 5. the style and themes are different than they already have but still fits their fabric lines. 6. the artist is willing to edit to their specifications. Craft and home sewing fabric manufacturers normally want art that have one or more central images and several repeating patterns that compliment the central image for craft projects (bags/totes, aprons, pillows, throws, wall hangings, organizers, place mats, coasters / hot pads, etc.). Below is a list of fabric manufacturers for mostly quilting but some also include fabrics for craft, and home sewing projects. Artist Jennifer Addotta has shared this link to additional fabric manufacturers. Illustrator Sarah Summers has shared this link for more manufacturers. Comments and suggestions about this article are greatly appreciated. Click on the comment section below to write your comments.